This is National Farmers Market Week according to the United States Department of Agriculture. I’m celebrating not only by going to a farmers market and a farm stand or two but also by making another recipe from the Shelburne Falls Farmers Market Cookbook, which I introduced in an earlier post. Bloody Brook Farm is a thriving farm in South Deerfield, Massachusetts. In addition to selling CSA shares, maintaining a farm cart with produce on the property, and doing wholesale work Bloody Brook has tents at several area Farmers Markets. During my most recent visit to the Farmers Market in Shelburne Falls, Steven Kelley of Bloody Brook was hefting some of the gorgeous heads of cauliflower that inspired him to create this hearty soup. I have adapted the recipe a little. It originally called for cooking the soup even longer after it was blended, but I felt that the flavors had had plenty of time to meld! I have also altered it by suggesting that one could add a little milk and cheese to offset the strength of the cauliflower (I might even try a bit more stock next time as my soup was ultra thick). Without them and with vegetable stock it would be an ideal food for vegans, however, so if you’re serving them please feel free to ignore my suggestions! Preheat the oven to 400 degrees. 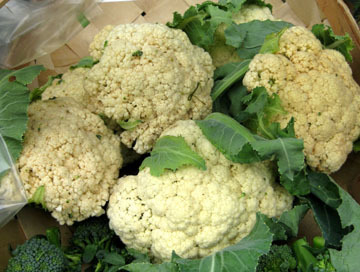 Lightly coat the cauliflower in oil, and place it in a large baking dish also coated with oil. Bake for 20 minutes, stirring at least once. Toss the onion wedges and garlic with olive oil, and sprinkle them on top of the cauliflower. Return the vegetables to the oven and cook for 20 to 25 more minutes, stirring once halfway through. While the vegetables are roasting, heat the vegetable stock and add the chopped potato. Bring to a boil and reduce the heat. Cook, covered, over very low heat until the potato pieces are soft. Add the cauliflower mixture to the broth. Puree it until it is smooth. Return it to the pot, and add salt and pepper to taste. Splash in the milk and heat the soup until it is warm. 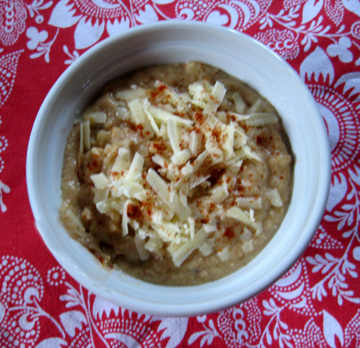 Ladle into bowls and serve with a sprinkle of paprika on top, plus a little cheese if you like. Serves 4 to 6. This entry was posted on Tuesday, August 4th, 2009 at 4:00 am	and is filed under Farms, Farm Stands, and Farmers Markets, Soups and Stews, Vegetables. You can follow any responses to this entry through the RSS 2.0 feed. You can leave a response, or trackback from your own site. 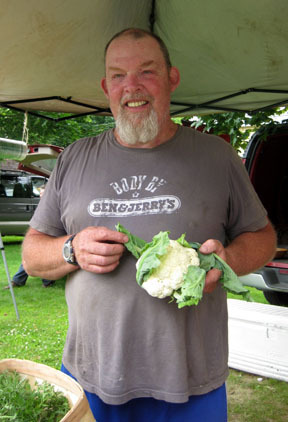 And here’s an article about a farmer down the road from me that grew Cauliflower for the local markets. I used to drive by, and see this farmer and/or his wife dressing the crop by a well head near the barn.